Google is celebrating its 20th birthday. That’s right, the search, advertising, and everything-else-you-care-to-mention giant has been a part of our lives for two decades. And, as is its style, Google is celebrating in a number of different ways. Google was born when two PhD students at Stanford called Larry Page and Sergey Brin developed a new way or ranking for searching for websites. The search engine was originally called BackRub, but quickly morphed into Google (a misspelling of Googol). Within a couple of years Google started selling keyword advertising Google's New Ad Settings Put You In Control Google's New Ad Settings Put You In Control Google has launched a new Ad Settings page which makes it easier than ever to control the kinds of ads you see when browsing the web. Read More , and the money came rolling in. Then Google launched (or acquired) a multitude of different products, including YouTube, Chrome, Android, Google Maps, Gmail, and countless others. Now, Google is turning 20, having been founded and incorporated in 1998. And Google is celebrating its 20th birthday in a number of different ways. Starting with this video to mark the occasion, which is also currently a Doodle on the Google homepage. Beyond that, Google has taken a look back at 20 years of Google Doodles, launched 20years.withgoogle.com, which is full of insights from the last 20 years, and added “Susan’s Garage” where it all started, to Google Maps. However, the best celebration comes in the form of Easter eggs Google has hidden in Search. When you Google specific terms, Google will ask “It’s 2018! Did you mean?” along with a more modern equivalent of whatever it is you’re searching for. Search for “MP3 file” and Google will suggest you “stream music”. Search for “watch a DVD” and Google will suggest you pay for a “streaming subscription”. And so on and so forth. TechCrunch has the full list for those who want spoilers. Google is now so big and all-encompassing that the vast majority of us have some dealing with the company. Whether by searching Google for information, using a phone powered by Android, or watching YouTube. And that’s both a blessing and a curse. The sheer size and scale of Google Google Is Now Part Of...Alphabet? What You Need To Know Google Is Now Part Of...Alphabet? What You Need To Know Google, the Internet giant, is turning into Alphabet. Here's what that means for you. Read More means the company isn’t going away anytime soon. 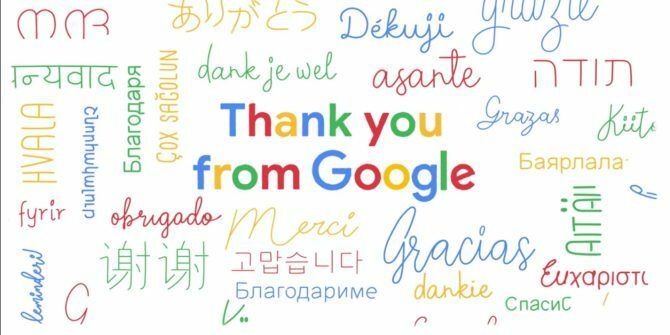 So, whether you love it, hate it, or merely tolerate it, Google is likely to continue being a part of our lives for another 20 years and beyond.